## Excellent Methods to Obtain ORMES, by VLAD, JEREL, ADAM (Wizard) and NDC from PDF files found on ORMUS Forum. This form of gold is known as “potable gold” because it is liquid. Actually “potable gold” is a mistranslation. It comes from “Aurum Potabile”, which comes from the hebrew word Aor (light) and the latin word potabile (drinkable), and therefor actually means drinkable light. Aurum should have been Aorum, but it was translated wrong, and so we end up with Aurum potabile – drinkable gold. – 1. Add hydrochloric acid to a colloidal gold solution until the pH is 1. – 2. Add a sodium hydroxide/water solution to raise the pH to 14, and the gold will precipitate. – 3. Let the gold settle on the bottom, then pour off the top water and evaporate the remaining water. – 4. Heat the precipitate in open air until it glows red hot – this will anneal off the hydroxyl group. – 5. When it cools, run a magnet over it, and a large amount of the gold will stick to the magnet. This is your easy way of proving you have superconducting gold, and also an easy way to separate it (put paper over the magnet). Gold isn’t magnetic, so the only way it could have become magnetic is if the atoms have deformed into monatomic superconducting gold. – 1. In a 600ml beaker, place 2 gold wires 3/4 inch from each other. Fill the beaker with 500ml distilled water. – 2. Connect the wires to a 36v DC source at 50ma (remember the polarity you used on each wire), and stir the solution sprinkling a pinch of potassium nitrate (KNO3) into the solution. – 3. Leave the solution going for the next few hours, and check on it every hour. When you see that the positive wire (anode) is coated with a burgundy color, turn off the power and remove the electrodes and dry them with a paper towel. – 4. Fill another 600ml beaker with 500ml of distilled water. Place the electrodes in the beaker, and make sure the anode is under the water enough so the burgundy color is submerged. Turn on the power (this time use 150ma), and add a pinch of salt (NaCl). Bubbles will form on the electrodes, indicating a reaction is taking place. – 5. After several hours, the colored coating will be gone from the anode electrode. Now go back to step 1, and do it all over again one more time. – 6. Heat the salt water beaker until it begins to boil. Keep stirring it constantly with a glass stir rod so the gold atoms don’t recluster into a large size. – 7. When the solution begins to boil, stir it so strongly that a vortex forms in the center. Squirt 2ml off hydrogen peroxide (3%) into the solution. Remove the stir rod and let the solution continue to spin for another minute. – 8. Gently agitate the solution to keep it from stopping. It will turn a light pink. Because colloidal gold is photo sensitive, the color will change to a deep ruby red the longer it’s out in the light (especially sunlight). This is because the gold clusters recombine and larger cluster sizes form. So put it in a dark place unless you want large colloidal gold for some reason. The above process is known as the “Jerel” method. Named after the man who invented it. Black sand is mostly iron oxides. But a small amount of this sand contains m-iridium and m-rhodium. By dragging a magnet around a beach, you can collect this sand. But the best place to get your sand is from volcanic ash. You can order this sand on the net for less than $10 a pound. Here is how to extract the m-rhodium and m-iridium from the sand and leave the iron behind. – 1. In one liter of water, slowly mix in 1 cup of sodium hydroxide. Add a very small amount each time, and make sure it doesn’t get too hot. Don’t breathe the fumes because they are hydrogen. – 2. Add 1/2 cup powdered magnetite and boil for 3 days. Refill with more water as needed. – 3. After the solution has cooled, filter the water through a stack of three coffee filters. – 4. Now slowly add vinegar a few milliliters at a time while stirring. When the pH is 5 or 6 stop and let the precipitate settle on the bottom. Pour off the top water and discard. – 5. Now dissolve the precipitate by lowering the pH to 1 with a few milliliters of hydrochloric acid. – 6. Dilute with 1 liter of water, then add sodium hydroxide slowly until the pH is 14. Little does the modern technological world know, room temperature superconductors can be purchased at your local grocery store; and for a very low price. Grape Juice for some reason contains a high concentration of superconducting monatomic elements. There is enough present in one can of frozen juice to be easily separated with a magnet. We know this isn’t iron because it would indicate that level of iron on the label. So the only thing left is monatomic elements. This fits well with David Hudson’s information about grapes containing large amounts of m-iridium and m-rhodium. But our bodies don’t gain access to these elements because of the high levels of sugar in grapes. This process below breaks down the sugar using sodium hydroxide, releasing the m-state elements which can then be separated using a magnet. The magnet charges up the monatomic elements and makes them become superconductive which is why they are attracted to the magnet. In their natural form, they are locked inside the sugars in the grapes and can’t be charged with a magnet, and this is why it does no good to place a magnet next to grape juice then drink it. But when dried and extracted, they can be fully charged, then ingested, and the effect is quite powerful in large doses. – 1. In a 250ml pyrex beaker, put 100ml of frozen Concord grape juice in it, then fill to 200ml with water. – 2. Add some lye to adjust the pH to 14, and slowly bring the juice to a boil. Turn down the heat when the boiling starts to cause the juice to overflow. – 3. Let it boil lightly for 6 hours or a little longer, until the water has evaporated and your left with a hard black crust. – 1. Dry the plant or wood material, then burn it on low heat until it is ash. By low heat I mean just keep it lit and dont let the fire get too intense or you will drive away the ORME m-state material. When the material is done burning, the ashes will be black. You want them to be very light gray, so heat them in a metal pan for a few hours, and they will gradually become lighter. – 2. Add hydrochloric acid to this ash (just enough to put the ash into solution – check the PH and make sure its 1.0 because the ashes of trees will have a lot of potassium hydroxide), and let it dissolve for a day, even when it *appears* to been done dissolving. – 3. Now evaporate the acid, and add a whole lot of water. – 4. Add pure sodium hydroxide crystals to the mixture while stirring. Only add about ¼ a teaspoon at a time. The misture will become very hot from the reaction of acid and base. Wait for it to cool off, then continue until the PH is 14. Dont breathe the hydrogen fumes. – 5. When the precipitate forms, wait for it to settle overnight so that its nice and compact on the bottom. The resulting precipitate will react to a magnet. If it doesnt then you may need to strongly fire the powder to calcine it end remove the hydroxyl group. This M-state is far better than sea water precipitate. .*.NDC.*. The best quartz to use for this process is the kind that contains gold particles. But even with normal quartz you can extract monatomic gold. To make this easier, you can use silicon dioxide powder, which is much cheaper than quartz crystals. The only conclusion I came to as to why quartz contains only gold would be that perhaps it’s crystal matrix produces an energy that either attract monatomic gold from the air, or more likely – it creates it. – 1. Dissolve 125 grams of sodium hydroxide in 1 liter of water. Do this slowly, adding only a tablespoon while stirring and waiting for it to dissolve before adding the next tablespoon. Now place your quartz in the beaker. – 2. Heat for 7 days at just below boiling, refilling water as needed. There is no need to add more sodium hydroxide to the new water because the sodium hydroxide remains in the vessel and doesn’t evaporate with the water. This process will leach out the monatomic elements from the quartz. – 3. Filter the solution through 3 coffee filters. – 4. Now lower the pH to 1 using hydrochloric acid a little at a time. If you adjusted the pH too fast, then not all of the silicon will precipitate. – 5. The silicon dioxide will precipitate out of solution and settle on the bottom. Pour off the top water and filter it through 3 coffee filters. Discard the silicon precipitate. – 7. You can now dry this precipitate and heat it to red hot, then let it cool. This will anneal off the hydroxy group. Run a strong magnet over it, and most of the material should stick to the magnet. This is the superconductive m-gold. 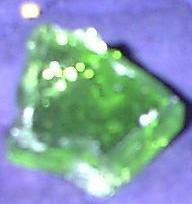 Sept. 15, 2000 – The following images are of a small (15mm approximately in its longest dimension) piece of green glass and the liquid we made from it. This glass was the only material remaining after a burn in a plasma arc furnace at approximately 10,000 degrees Celsius. We broke off a small shard of this green glass, placed it in an about 20cc of undilutedmuriatic (HCl) acid and added about 3ml of 35% hydrogen peroxide. After a few minutes it became clear that the shard was dissolving in the acid. Bubbles were forming on the surface of the shard and rising to the top of the liquid. I placed a magnet over the shot glass, that this process was happening in, so as to discourage any ofthe little ORMUS buggers from getting away. After about ten minutes the acid in the shot glass was getting a definite green tint. Eventually we decided to move the shard to a larger glass jar so that we could add more acid. It looked like the existing acid would saturate soon. We decided to remove the shard from the solution before it all went into solution. The dried shard was encrusted with a white powdery material which seemed to be ridged like sand blasted wood grain. When I flaked the encrustation off the green glass itself had a similar wood grain look to it. I added about half a teaspoon of Morton table salt to keep any m-state happy where it is. Here is a close-up image of the glass and encrustations, which shows the raised wood grain look more clearly. The gas bubbles were probably a combination of ORMUS gas and chlorine gas. The smell was definitely of chlorine gas but we both noticed that our lips were “slicked” by being around this stuff. We also both noticed some fairly strong psychological effects. My colleague literally felt spacey and was having trouble seeing this world. I also felt a little spacey and the nada in my right ear became louder. On Sept. 15th Iput a speck of the white crust on my tongue and it seemed to dissolve. I also broke off a speck of the green glass and put it on my tongue. It also seemed to dissolve. I had a rather fitfull night’s sleep with lots of remembered dreams the night after I tasted this. 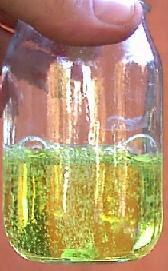 Sept. 17, 2000 – I just examined the green chloride again and noticed that there is a white precipitate in it. This precipitate is in a very small amount (about 3-5 ml in approximately 225 ml of liquid) at the bottom of the jar. I took about 25 ml out of this total and mixed it with 100 ml of distilled water. When I brought the pH on this up to 10.6 more precipitate formed. This looked like about 6-10 ml of precipitate from 1/5 of the total amount of material. I suspect that most of the m-state in this liquid is in the oil form but I have no way of testing this. I brought the pH down to about 4 because it seems to be happier at low pH. I put a drop of this on my tongue and it had a tart but oddly sweet taste. I added another 9 drops to some water and downed this. After tasting this I am noticing a “full” feeling in my head. This feels smoother than the HR material in some way. The nada in both ears is louder with the right being loudest. My left wrist hurts a bit. # Introduction: Most would agree that the pinnacle of ORMUS production techniques would have to be the classic sodium burn method, introduced to us by an individual whom, for purposes of the Internet, prefers to remain known only as The Essene. The sodium burn method is quite effective at disaggregating metals, but it unfortunately requires the experimenter to handle a fairly spirited if not downright dangerous substance – namely elemental sodium metal. Sodium metal itself is both caustic and toxic, but much more problematic is the fact that elemental Sodium spontaneously breaks down water into its component parts, Hydrogen and Oxygen, immediately upon contact. This reaction occurs so quickly and so violently that it produces a great quantity of heat, which more often than not ignites the highly flammable Hydrogen gas, and that Hydrogen gas then burns even more fiercely due to the presence of all that free Oxygen. If a large enough quantity of sodium metal is involved, sufficient heat may be generated by these burning gases to reach a temperature where the sodium metal itself may then ignite – and now you’ve got some serious fireworks on your hands! While elemental sodium metal can be safely handled with the use of a little common sense, it is possible to attain results rivaling those of a sodium burn, by utilizing a much tamer substance – namely the hydroxide of sodium, more commonly known as lye. This process has come to be known as a “lye fusion” or lye burn. It works well with black volcanic sand and it works very well with copper metal. Unfortunately it has not proven very effective with gold metal, however when you consider that the cost of a pound of sodium metal is roughly $150 vs. an 18 oz. container of lye at three dollars and change – it makes pretty good sense to save the sodium metal for use with gold or other precious metals. It has been stated that Red Devil brand lye is almost as pure as reagent-grade sodium hydroxide. Others claim that it contains contaminates. The author knows of at least a dozen people who have been using Red Devil lye in their alchemical Workings and ingesting the end products for years, and they are all still alive and kicking – but if you are a perfectionist and worried about every part per gazillion of contaminates, lab-grade sodium hydroxide is readily available, of course at a significantly higher cost. Perhaps this is also a good time to mention another controversy: that of glass vessels vs. boiling lye. For all of you self-proclaimed scientific geniuses out there who are so fond of pointing out that boiling lye reacts with glass, the author has used the same Pyrex glass boiling crucible at least 25 times now with no appreciable signs of attack other than a fine white film on the inner surface of the crucible, and that is only in some spots. The ancient alchemist had no such advantage as corrosion-resistant borosilicate glassware to work with, yet somehow they got the job done without perishing. It is this author’s opinion that, especially for a beginner, the advantages of being able to see and more precisely control the boiling process far outweigh any “danger of contamination” from lye attacking the glass. # Nuts and Bolts: The lye fusion method is a relatively straight-forward procedure. If you can afford it, a sturdy, covered titanium crucible seems to be preferred for working with either elemental Sodium metal or Sodium Hydroxide. If you cannot obtain a titanium vessel, acceptable results can be had by using a crucible made from 1810 stainless steel. Generally, a small 5-inch or 6-inch diameter stainless steel cooking pot with a well-fitting stainless steel lid makes an acceptable vessel. Make sure to remove any plastic handles or knobs that may be present, and plug up any left-over holes with a stainless steel nut and bolt. Another caution – make sure the handle is not riveted on with aluminum rivets. The aluminum rivets will melt almost as soon as your crucible hits the fire (…don’t ask me how I know this!) and should the aluminum metal make it’s way into the lye – toxic compounds will be formed and your project will be ruined. Drill any aluminum rivets out and replace them with stainless steel nuts and bolts, or simply leave the handle off and plug up the holes with stainless hardware. If you are unsure of the composition of your crucible – do a dry run in the fire first and see how it reacts. Better to find out you’ve got a problem with an empty crucible, instead of a pot full of valuable prima materia. 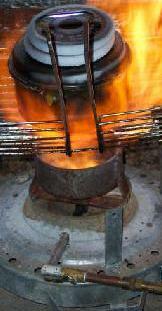 Heating the crucible to red heat will also remove any traces of oils, waxes or chemicals that may be present. 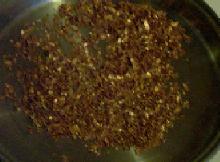 Copper flakes ready to mix with lye granules. # Into the Fire: A good source of heat for the lye fusion process is a propane “turkey cooker.” These are readily available (especially after the Thanksgiving holiday) from most discount, department or dollar stores for somewhere in the neighborhood of 40 dollars (US). WalMart and Sears Hardware stores often “blow them out” on clearance sales for as little as $14.99 per unit! Try to find one that is rated at least 145,000 BTU. A turkey cooker offers a distinct advantage over other types of propane burners in that it is already set up with an acceptable platform upon which to place the crucible. The author uses a large de-commissioned propane space heater sold by W.W. Grainger that produces 250,000 BTU of heat. It is a great big bear of a burner, good for outdoor use in cold climates, but it does not come with a ready-to-use platform for the crucible. You’ll have to rig something up yourself. The author’s “Big Bear” of a burner. Be advised: If you want to be able to attain cherry-red heat outdoors, even in very cold ambient temperatures, you are going to need a BIG burner. It is also a good idea to set up some sort of a wind-break around your burner. CBS blocks or bricks are the best bet, but wood may also be used if sufficiently insulated by facing it with foil-backed insulation or sheet metal on 1/4″ standoffs. Place your crucible and its contents onto the burner platform and place a 2-3 lb. weight on the lid. A metal barbell weight works well for this. If nothing else, find a good-sized rock or a brick. Avoid using concrete, as concrete tends to “explode” when heated rapidly due to the expansion of trapped internal moisture. Try to get your crucible centered over the burner as best you can. Some re-positioning of the crucible may be necessary once you fire it up, so have some sort of implement ready. Fireplace tongs work nicely for this, and it also wouldn’t hurt to have a good pair of welders gloves handy. Fire up the burner and try to get the crucible completely engulfed in the flame so it is heated as evenly as possible. # Bubble, bubble…: Remove the weight from the lid of the crucible as soon as you turn off the flame – since this will usually take much longer to cool than the crucible itself and it’s entire contents. When the crucible is cool to the touch, remove the lid. It may be necessary to tap the cover of the crucible gently around its circumference with a small hammer to get it to loosen up and come off. Remember people, this is highly caustic LYE – chunks of it may go flying around >>> ONE SPECK OF IT IN YOUR EYE WILL BLIND YOU FOR LIFE! Always use safety goggles or safety glasses. Work near a sink and have a bucket of fresh water on hand to use for an emergency eye-rinse. A bottle of vinegar to neutralize any lye burns on the skin is also a good idea. Inside the crucible after a burn. Unlike a sodium burn, the material in the pan is still very water soluble after a lye burn! Anyone who has ever spent a few hours with their hands stuck in a plastic bag, chipping and smashing chunks of caustic sodium-metal “cement” loose from the bottom of a steel pan will definitely appreciate this point. Set the crucible down into the bottom of a large plastic bucket and SLOWLY add distilled water to it, stirring with a large plastic or stainless-steel spoon. When no more of the burned material will dissolve into that batch of distilled water, dump the water out into another plastic bucket and add some more fresh distilled water. Continue this procedure until the crucible is empty. Pour the dissolved material, and any leftover sand, metal, or what-have-you into a 2 quart stainless-steel pot (or Pyrex casserole) with a well-fitting lid. Add more 1:8 lye solution [16 oz. lye to 1 gallon distilled water] if necessary to bring the level up to within an inch of the rim of the pot. Again, it is a good idea to put a weight on the lid to keep as much steam from escaping as possible. Bring the solution to a GENTLE ROLLING BOIL over a GAS flame, and boil for 4 – 6 hours, adding more pre-heated distilled water periodically as needed to keep the level constant. # Filter Time: Allow the solution sufficient time to cool and settle. Unfortunately, this might take an entire day…or longer. If you have ever done anything that has anything at all to do with Alchemy, then you know it takes a lot of PATIENCE. Nothing will come of this procedure that will make anything happen in a hurry. We’re not baking a cake here. This isn’t moonshine we’re brewing. In most cases, the effects of M-state materials take months and years to manifest, so WHAT’S YOUR HURRY? If you allow sufficient time for the material to settle, your menstruum will be almost crystal-clear and it will filter quite quickly and easily. If you rush it – you will clog your filter paper and it will wind up taking even longer to get the job done. The best method is to siphon the top liquid off of the settled solids using a length of vinyl tubing (like air tubing used with an aquarium). If, however, you are one of those people that just never got the hang of starting a siphon, you can simply use a ladle to scoop out the liquid slowly so as not to disturb the settled solids. Whichever method you choose, when the liquid level gets low, removing the last of it will be a little easier if you cant the vessel to one side by propping it up underneath one edge with something. The best method is of course is to vacuum filter the menstruum with a Buchner funnel and a 1 micron glass filter, however this is not absolutely necessary. Even if you plan to do a vacuum filtration, you will still need to pre-filter the material. Shown below is a method of filtering that has proven to work well either as a prelude to vacuum filtering or as an end in itself. Obtain some stainless steel strainers (try a dollar store) and stack 5 coffee filters into each of three strainers. Place 3 clothespins evenly spaced around the rim of the first strainer, and pre-wet the filters with distilled water. Repeat with the second strainer, then place the second strainer inside the first, resting it’s clothespins directly on top of the first set of clothespins. Repeat with the third strainer. Some juggling of the clothespins may be necessary to get everything situated, but once everything is in place, the setup will remain stable throughout the procedure. A handy setup for pre-filtering. # Rock that pH! : For this portion of the process it is best to use a pH meter with decent resolution, preferably one that has temperature compensation. Simple pH paper simply cannot successfully be used for this. Why, you ask? Because unless you have eyes like an oriental pearl sorter, it is impossible to discern a fraction of a pH point with pH paper, not to mention the fact that you will need about 200 pieces of pH paper every time that you do this. Practically every piece of lab equipment used in Alchemy can be fudged with kitchenware or other common items, but not the pH meter, sorry. If you are serious about alchemical Work, break down and buy a decent meter, and I don’t mean one of those $39 specials suitable only for checking your salt-water aquarium. Get yourself a real pH meter. Probably the best-known source for pH meters is Hanna Instrument Co. and their most economical, yet still decent meter would be the HI8314. Assuming that you have a decent pH meter, put a sufficient quantity of your menstruum into a large beaker or other Pyrex glass container, position the meter probe(s) and begin stirring the solution with a glass rod or nylon spoon. Be sure the stirring tool is resistant to room-temperature acids and alkalis. Slowly drip in 20% – 30% HCl into the menstruum while constantly stirring. >>> Once again, remember…you are DRIPPING CORROSIVE ACID into CAUSTIC LYE. ONE DROPLET OF EITHER SPLASHED IN YOUR EYE WILL BLIND YOU. Always use proper eye protection. Work near a sink, and have a bucket of clean water available as an emergency rinse, and some vinegar to neutralize any lye burns on the skin. The goal here is to adjust the pH slowly, lowering it by no more than .1 pH point per minute. Monitor the temperature of the solution while you are titrating it, and do not allow the temperature to go above 45 degrees Centigrade (about 100 F). If the temperature reaches 45 C, stop and let the solution cool. Go make a cup of tea or something. – remember, we’re not in any hurry here. Bring the pH slowly down to 1.0 and stop. You may notice a characteristic effervescence of the menstruum just before this point – this is quite normal. If the temperature is still low enough, begin dripping in 1:8 lye solution, again while constantly stirring. This time, the goal is now to RAISE the pH by no more than .1 pH point per minute. As before, do not allow the solution to heat above 45 degrees C. When you get to about pH 7 or 8, depending on the temperature, you should see a white precipitate beginning to form. If you are working with copper or black volcanic sand, you can take the pH up to about 9.5 and stop. If you were working with Copper metal, look very closely at the color of the precipitate which forms. The precipitate MUST be white – any other color except white is no good. If you should happen to get a blue or green precipitate, re-dissolve it by once again dripping HCl into the menstruum slowly until the pH goes back down to 1.0 and try again. This time work much, much more slowly. # The Fun Part: All that’s left to do now is to wash (almost) all of the salt out of our precipitate. Find a large slender glass vessel shaped like a cylinder and pour the solution into it to settle. Cover it with plastic wrap to keep dust, bugs, etc., out of it. You will find that your precipitate will settle much faster if it is kept in the dark, so put some aluminum foil, or a brown paper grocery bag over your settling vessel while it falls. Department and dollar stores sometimes have large glass candle-holders that make excellent precipitate-settling cylinders. Some hold upwards of 2 liters of solution and they are very inexpensive, so you won’t beat yourself up so bad when it slides through those lye-slippery fingers and goes crashing to the floor. 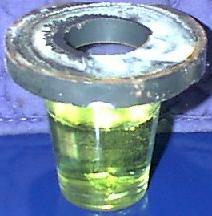 An acceptable glass cylinder can also be made by removing the top portion of a glass bottle, but this will be left up to the resourcefulness of the individual. When the solution has settled completely – again, this may take a day or longer – pour or siphon off the top water until only precipitate remains in the cylinder and add roughly 3 times the volume of the precipitate of distilled water and let it settle again. When this has settled, taste a little bit of it with a plastic spoon. If it is still too salty for you, wash it again. If you plan to carry any of the solution anywhere by car, or send any of it to someone by mail, be sure to leave plenty of salt in it to protect it from x-rays and EMF from scanners, etc. Be careful when you do the lye boil that you are not dissolving glass and getting that as your white precipitate. I remember, as do many, thinking that a long lye boil was so much better than a short one since you get so much more precipitate…it was silica. Some have used HDPE or Teflon in a pan of boiling water to rule out silica. For my akaline work, I use what I think is probably the ultimate (also in expense and thus small)…a solid gold crucible. The electrically handy like yourself can probably electroplate a copper cup or crucible. The other option is Na3PO4 (TSP) boil, which I don’t think (but don’t know for sure) will dissolve the glass. I prefer TSP. This is not to dissuade you from your path, which sounds real good, just to make sure you are aware of that potential so you know for sure what you have. # First stage: A particular gem, mineral or rock is selected. Pictured here: An Obsidian from Oregon, black, with red patches. This is an actual stone we use for the elixirs. # Second stage: The internal, crystalline structure of the gemstone has been destroyed; the formerly hard stone has been turned into a brittle mass that is easily broken by hand. Such a transformation is usually accompanied by a change in color. This is the first step in manufacturing a truly alchemical preparation: In alchemy, we postulate that every created thing, no matter if it is a rock, a plant, or an animal, is permeated and held together by the creative energies or by the nonphysical conceptual blueprint specific to the material at hand. Steiner called this the “formative forces”. In alchemy, it is simply called “spirit”. In alchemical literature, we find the Latin instruction: solve et coagula, which stands for “dissolve and coagulate”. Its deeper meaning is to dissolve the body, and to coagulate or capture the spirit. At this stage, the gemstone has undergone the first “dissolution”. # Third stage: A look at the flask as we take it out of the incubator, after it has been exposed to at least six weeks of gentle heat. The gemstone had to undergo several treatments to arrive at this stage: The brittle mass of stage two shown in the Obsidian picture sequence was reacted with a plant-derived salt. This reaction is achieved by high temperature cooking, reminiscent of preparing a crème anglaise. The purpose of this step is to further dissolve the material into nanometer-sized clusters, and to prepare the compound for taking up the so-called spiritus mundi, which translates as “spirit of the world”. In alchemy, we do not engage in the academic discussion whether the ether of the ancients does exist or not, we put it to use. This is the ancient and still secret technology at the core of our manufacturing process. We let the solvent extract the formative forces of the gemstone or mineral. The liquid thus obtained is a carrier of a nonphysical component, aptly called the etheric part or spirit, which interacts directly with the human mind on an etheric level. In alchemical literature, this extraction technique is called circulation or simply fermentation. # Fourth stage: The liquid obtained from circulation is alcohol- and pH-adjusted and submitted to cold plasma treatment for further enhancement. The microclusters of the gemstone expand into the now lesser dense solvent, forming a supersaturated solution/suspension in what has now become the so-called mother tincture. # Fifth stage: The finished product, the gem elixir in homeopathic potency 1X. Ancient alchemical texts suggest dilutions of up to 1:40. In alignment with modern homeopathy, we dilute the mother tincture only at a ratio of 1:9 to obtain the homeopathic potency 1X. This means one part of the mother tincture is diluted and succused (vigorously shaken) with nine parts of distilled water and alcohol. At this low dilution, the finished elixir still contains more microclusters than the solvent can hold in solution – a precipitate is present, which is why we suggest shaking the bottle once before taking the elixir. In January of 1999 Kevin M. suggested that you could use fractional freezing to concentrate ORMUS. He wrote: Another technique that has worked well in the past is fractional freezing, i.e. freeze half the water in a plastic drink bottle. Break the ice, pour the water fraction through a strainer and repeat until there is about 10% of the starting volume. This water is oily as well. In November of 1999 I gave a workshop in Bisbee, Arizona and a woman at the workshop told us about her experience with fractional freezing. She also claimed that she felt some ORMUS effects from the fractionally frozen water. In December I set about fifteen gallons of water outside in the below freezing weather and let it freeze over night. I froze a portion of the water and took the unfrozen center portion and froze a portion of it the second day and so on till only a couple of quarts was left. I put this remaining water in the refrigerator and forgot about it till a couple of days ago. I noticed that there was a white sediment covering the bottom of the glass jar. I tasted the water and it “tasted” strongly of m-state. I have not removed any of the white sediment from the bottom yet but it looks suspiciously like the sediment which sometimes drops out of enriched m-state water. Another thing we noticed about the fractionally frozen water was that the center water seemed to have a lower and lower freezing temperature with each freeze cycle. I have kept some of the innermost water from the fractional freezing process in my refrigerator. On May 2, 2003, I finally thought to take a picture of it. As you can see below, the white “sediment” is quite evident in the water. There have been other hints that the freezing point of water can change under certain circumstances. Russian pyramid experimenters report that water in one of their tall thin pyramids would not freeze. Based on these observations we started to look for evidence that plants which had been given ORMUS would be more tolerant of freezing temperatures. The first evidence of this was submitted by an ORMUS researcher in the winter of 2005 – 2006. He sent me a picture of a Butterfly Bush that kept it’s leaves through the winter after having sea water precipitate applied the previous fall. Just put a 100% piece of Gold in the HOT SPOT of a Pyramid, and you will see an oily substance coming out of this metalic Gold; it’s M-state Gold, ORMUS GOLD. PYRAMID means PYR from PYRO = FIRE (PYRO) and MID = MIDDLE ==> FIRE IN THE MIDDLE ! I am currently attempting to replicate Joshua Gulick’s claim that a pyramid can make gold turn into a white powder (ORMUS gold, AKA “The Philosopher’s Stone”). Josh’s account can be found here http://www.subtleenergies.com/ormus/tw/pyramidgold.htm . 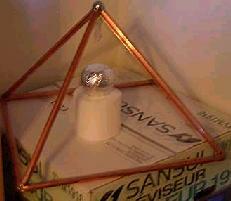 Details of initial experiment: I constructed a pyramid from 1/2″ diameter copper tubing. The base is 18″ square. The side pieces are ~17.1″ long. A 1.125″ steel ball bearing at the apex, this was done as a convenient way to hold the pyramid together. I feel any type of pyramid will work the same. Initially I had a quartz crystal and vaseline glass marble in the apex, I later removed these. It did not appear to effect the process. The gold is a 24 karat 1/10 oz. Canadian Gold Maple Leaf (1982). It is pure gold. The coin was placed in a new shot glass. Then I covered a small glass container in aluminum foil tape, and it goes over the shot glass. This shields the gold from light, and keeps it protected from the outside environment. This sits on a roll of toilet paper, which positions the gold in at 1/3 of the height of the pyramid. This is the focal point of the pyramid (the king’s chamber). The pyramid is aligned to magnetic north (this is very important!). Here a picture of setup, sorry it is so blurry. The vaseline glass marble and quartz crystal under the apex of the pyramid have been removed since this picture was taken. 24 hours later I checked the coin. There is no visible change. I rub the coin with my fingers, it feels slightly slippery. I licked my fingers, and after a few minutes my stomach felt a little strange, like when I drank my first trap water . I found this encouraging, and tried hard to leave it alone for a week. One week after touching the coin, I check again. There is still no visible change, however there is a oily film on the coin that I can feel. I taste it, and it is sweet like honey! I was really hungry when I did this, and then it my hunger seemed to fade, I didn’t bother eating for another 2 hours. My stomach felt a little weird the rest of the day. The sweet taste would return periodically, even after I had eaten. I became quite energetic, and I worked on a paper I had to get done for school. I worked on my computer for 2 hours without getting up, and when I did I was surprised. I felt very strange when I got up. My balance was off a bit, and everything seemed different, but I am not sure how. I felt like my awareness was expanded, like I was bigger than my body. I went to bed and felt so weird, I was sure I was going to go out of body. I slept very well, and the next day things still seemed a bit different, this faded as time went on. I had a weird feeling in my head. When I first woke up I thought it was a headache, but then I realized it was more like a light dull pressure. And it was just in a small circular area (~1.25″ round) between and above my eyebrows, where the pineal gland (third eye?) is. I also noticed a faint sweet taste in my mouth once or twice. It was like when I first tasted it, but not as strong. It is a sweetness unlike any form or honey or sugar, it is a fantastic taste! I am certain that the pyramid is converting my gold coin into ORMUS gold. The oil of gold forms first, and then becomes the white powder (I haven’t got that far yet). This form of gold certainly fits the description of manna, judging by the taste. The process is pretty slow, but it is happening effortlessly. I haven’t generated enough to see, but the effects of it are sure powerful. I think if I could make enough to have some ever day the effects would be mind blowing. Future Plans: I think a larger pyramid will convert more gold at a time. I am going to dig out my 6 ft pyramid this spring and try it. I may build a pyramid even bigger than that. I also would like to try some inert gas energy beams and other forms of orgone like energies to see if they will do it too. I may also try this experiments on other metals, like copper, to see if I can convert other metals to their ORMUS states. Implications: This experiment really opened my eyes to how pyramid energy works. I have experimented with pyramids a lot, and this really ties things together for me. There is plenty of documentation of leaving coins in pyramids to loosen tarnish off them. It takes a few days and then it just wipes off. One author I remember who did this used a silver coin (if memory serves me). Now if the pyramid converts the metal to its ORMUS state or m-state, the metal below the tarnish will first become a oil of the metal. Now the tarnish is floating on this, can it can be wiped away with little effort. It makes sense to me. I haven’t tried this with other metals, so I cannot say with 100% certainty that this true. I only know that it works with gold. This could also explain how pyramid energy (and maybe other forms of orgone energies??) effect living things. The Pyramid Energy http://www.geocities.com/undergsci/pyramidenergy.html section of my site documents my growing plants under pyramids (see sci fair section). Plants grow a lot better under a pyramid. I also know first hand that pyramid energy effects people, as I slept under pyramids for a year. Pyramid energy seems to be very beneficial for living things (except parasites). But how does it help living systems?? Well now I have some ideas as to how pyramid energy interacts with living organisms. We have metals in our bodies, in the form of minerals. Some of these metals can exist in ORMUS form. So perhaps exposure to pyramid energy causes a very slow conversion of these materials into m-state form. The effects would seem to be consistent with ingesting very very small amounts of m-state materials. As I understand it, ORMUS/m-state materials make life possible. If your losing more of these materials than you take it, you age. This is why people consuming m-state supplements experience reverse ageing (not signs of ageing, actual physical age). ## Pyramid to make ormus, by NDC, from ORMUS yahoo group. In either the files section of this forum or the ORMUS_SWG forum I uploaded a short video from the show Myth Busters, and the proved a frame pyramid does not work. Using it on plants, I was also able to demonstrate to myself that it’s worthless. And if you read the book “Mind Machines You Can Build”, they did extensive testing and tried many different types of pyramids until they came up with the good design. It’s also no coincidence the Russians who are building large and tall pyramids never use just a frame. And what works even better than walls is a solid pyramid with a rectangle hole in the middle. 2.5 by 1.5 by 1.5 if I remember correctly. And even better than that is a large scale pyramid which compresses the blocks with massive weight, and then the 3 granite slabs spaced apart from each other above the Ki, smooth on one side, flat on the other, depending on if you want to receive or send. On some farm land in the Northern USA I plan to build a massive replica of the Great Pyramid. Massive meaning at least equal in size. Won’t be doing it by myself of course. The levitation technology of ORMUS will certainly makes things easier and faster. All stones will be poured on spot, except of course the granite and the Quartz capstone with gold stingers for changing the electricity into light bright enough to see from the moon. Sound nuts? Don’t think I’ll be able to place 3 million stones in my life time? Well it’s gonna be quite a long life… .°.NDC.°. The Myth Busters are sensible and logical people. Download the video and you will see just how well they performed the experiment. They even align the pyramids north/south. They cleaned the apples with bleach also and made sure everything was sterile. They aren’t bent on trying to *disprove* anything. They simply carry out the experiments and show the result, even when the information is dangerous like how to bypass security systems and break into safes. Why try to dismiss the well carried out scientific tests the Myth Busters performed with frame pyramids just because they don’t match your untested beliefs about what a frame structure does?Grow plants in a frame pyramid, and grow identical plants in the same conditions right next to it. Nothing happens. No difference is evidenced. Pyramids do work, and I’ve been able to make a seedling grow from out of the soil to 1 foot tall in a week, while normally the seeds would just be peaking out of the soil by the end of the week. But so far I’ve seen no evidence of a pathetic frame structure produce any verifiable results. And I’m not surprised that strings or sticks arranged a certain way don’t do squat. And as far as ORMUS and room temperature superconduction — if someone were to send the Myth Busters a small levitating clay disk which contains properly made ORMUS, they would indeed put it on the show for all the world to see and say “CONFIRMED”. .°.NDC.°. ->Is Josh still around? Anyone talk to him about the article Barry posted up on his site? It’s been over half a decade since the 2001 “Pyramids make ORMUS” story. So far, nothing from anyone to confirm it as being true. Check the archives. .°.NDC.°. I am getting actual ORMUS precipitate from collecting Dew Water. I have not tried using ice yet, but instead am using Sodium Hydroxide. It pulls the moisture right out of the air. Because the Sodium Hydroxide is the extreme of high PH, the precip forms right in the solution so you can see just how much ORMUS you are collecting. So far just a cup of dew looks to have produced at least 1 gram of what would be dry ORMUS powder. Even after all of the Sodium Hydroxide has been dissolved by the dew, it will continue to pull moisture out of the Air and produce ORMUS precip. My intention is to separate the ORMUS precip from the Sodium Hydroxide solution with the usual washing methods. I will post my results. I started with 2 pounds of fresh Sodium Hydroxide. I am using a tupperware bowel. So far I still have undissolved Sodium Hydroxide in the bottom of the bowel. I have poured off the liquid that is forming into another clear plastic bottle. I only have about one fifth of undissolved Sodium Hydroxide left in the bowel. The precip is dropping down in the clear plastic storage bottle. I will post a picture or two in a day or two. Oh,,, I just realized that ORMUS could also be finding its way into the clear plastic storage bottle because the little buggers are so small!That will also make an interesting experiment. I will of course guard against the storage bottle developing ORMUS tunnelling leaking. And with that here is a thought,,,,, this is interesting, ,,,What if the cause of ORMUS bottle breakage is not that the ORMUS is trying to escape the bottle, but that ORMUS from the Air is trying to add itself to the ORMUS stored in the bottle?